The Spectra 9 Plus Portable Double Electric Breast Pump – for moms wanting complete portability and flexibility so they can pump how they like, when they like and where they like! Portable – built in rechargeable battery. The Spectra 9 Plus comes with a complete double kit so you can double pump – pumping both breasts at once saves so much time, which as a busy mom trying to find time to express, you will really appreciate. Double pumping also ramps up levels of prolactin (the milk producing hormone) in your blood, so is better for supporting milk supply. Easy adjustment of suction strength and cycle speed together – touch button controls allow you to adjust suction strength and cycle speed with one touch. As you increase the suction, the speed will slow down. The Spectra 9 Plus is Spectra’s most portable pump – lightweight and slimline, it will slip easily into your handbag. 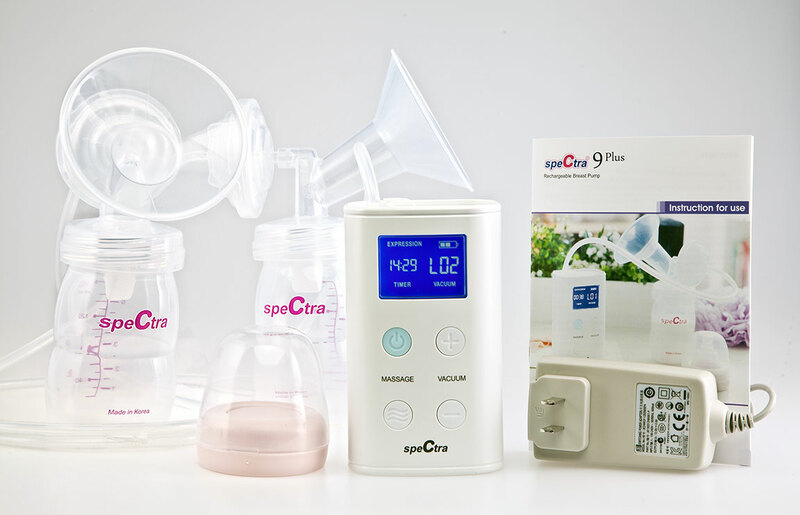 Closed system – like all Spectra breast pumps, the Spectra 9 Plus has a closed system, which means that there is no way for milk to get into the pump motor. Milk particles in the pump motor can lead to the growth of mold and is a potential source of virus transmission.